Gorgeously colored gowns, perfect face paint and enough gold to outshine the West African sun. All the trappings of a typical beauty pageant, except the women in the village are dressed in all black and standing in line waiting for the event to begin. Many cultures around the world follow the heteronormative “rules” of courtship and relationships that we see in dating, marriage and traditional gender roles . Not the nomadic tribes in Niger, or neighboring Chad and Nigeria. 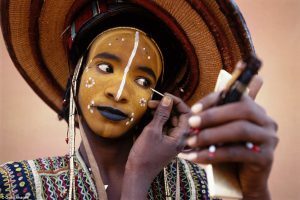 These tribes take time once a year to participate in the tradition of Gerewol – or Guérewol, meaning “to line up” in Fula – a language spoken across 20 countries in Central and West Africa. This annual courting competition is a seven-day event where men do the dolling up and women admire and judge according to looks and talents. In a culture where some tribes practice multiple marriages and freedom of sexuality amongst women before marriage, this flirtation festival gives women of the tribe the opportunity to pick their next potential mate, and rate the available men in their proximity. Some men are competing for wives, others just the satisfaction of knowing that they are desired. There are also, of course, the bragging rights that come with winning the battle of sexual supremacy. Following reporting by western documentarians and publications such as National Geographic & Conde Nast Travel, the courting festival has become a well-attended tourist attraction. A quick internet search will give you pages and pages of photos of men with multi-colored painted faces, vertical lines sharpening the nose, wearing elaborate headdresses and gold jewelry galore. Images of the women at the festival show their astonishingly gorgeous, make-up free faces peeking out from dark-colored hoods. They come to the festival to judge the hard work (and marriage potential) of men from far and wide, often times outside of their own nomadic tribe. Music accompanies the festival. Open frame drums and end-blown flutes open the events and signal the start of choral performances, choreographed dancing, and camel races. The competing men have had little to eat and drink in preparation for the the festival; They want to be in top physical and visual performance for the rigorous event. An interested woman can follow her object of affection into the bush where he must continue to woo her with poetry and riddles. The woman then decides if she would like to spend more time and test their compatibility before moving forward to meet the family and plan for marriage. From the festival to the final dowry agreement with the potential bride-to-be’s family, the pace and process of courtship is governed by the women of the tribe. A piece written by the Daily Mail characterizes the annual events as a “wife-stealing” festival. Many of the women witnessing and judging the competition are currently married and looking to find another male to begin courting them. In my opinion, the “wife-stealing” monicker makes the men (both husbands and potential prospects) the focus of Gerewol when the amazing aspect of the ceremony is just how much power and authority is held by the women of the tribe. How fist-raising feminist it is for men to spend hours getting dressed and made-up for the sole purpose of catching the eye of available women! This has been the premise of western cultures beauty pageants and feminine beauty expectations for centuries. The role reversal seen at Gerewol should be recognized and celebrated. Women wait and watch, and hold the decision on their next potential partner. Let’s give it up for girl power!